You may have experienced this before – you go to a bar, or a store, and pick up a bottle of your favorite beer or other drink, and notice that the label or packaging, or even the bottle itself, is different than it was before. “Huh, neat,” you comment, then go about your business of shopping or drinking – after all, it’s what’s inside the bottle that matters, right? Few people realize just how much work goes into packaging redesign, or how it actually does impact the buyer, even on a subliminal level. Teams of designers work to get a new look just perfect, while the manufacturer evaluates the costs and decides if a change is worth it. 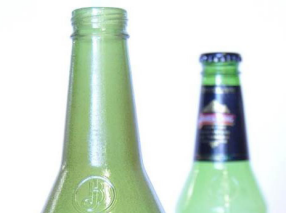 James Boag’s Premium Lager is an Australian beer that recently underwent a bottle makeover. The makers of the beer were considering a change to the bottle, but had to decide whether it would be worth the money. They didn’t want to make a change just because they could; the new design would have to be attractive and well-received by customers. They were hoping to make this determination before significant time and money were spent on the redesign. Packaging company Orora, which supplies James Boag’s bottles, decided to go with 3D printing to create a prototype for a new bottle. The company contacted 3D Systems On Demand Manufacturing, which took on the challenge of creating a 3D printed bottle with the same clarity and hue as glass, as well as the same in-hand heft. Using SLA 3D printing technology and VisiJet SL Clear resin, 3D Systems 3D printed four prototypes, countering the disparities in weight by adjusting the interior wall thickness of the design file based on the density of the resin. They also carefully color-matched to get the same green as the original bottles. After being 3D printed, the bottles went through an in-house finishing protocol that included wet and dry sanding and the application of a surface tint and final clear coat. According to Tracy Beard, General Manager for the On Demand Manufacturing facility in Lawrenceburg, Tennessee, thousands of clear parts are produced every week in that facility alone. “The materials are versatile enough to be quickly finished and tinted for perfect prototypes,” Beard said. It took only a week for the models to be completed, at which point they were outfitted with labels and caps and filled with liquid. They were then put in a shop for monitoring, and feedback showed that the new design was a hit, giving the James Boag’s team the confidence to go ahead with the full redesign.